pus in the anterior chamber of the eye. The presence of leukocytes in the anterior chamber of the eye. /hy·po·py·on/ (hi-po´pe-on) pus in the anterior chamber of the eye. the presence of leukocytes and an accumulation of pus in the anterior chamber of an eye, which appears as a whitish or gray fluid between the cornea and the iris. 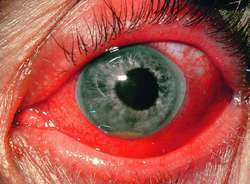 It may occur as a complication of a penetrating wound to the eye, conjunctivitis, herpetic keratitis, or corneal ulcer. The presence of visibly layered leukocytes in the anterior chamber of the eye. A layer of pus cells in the aqueous humour at the bottom of the front chamber of the eye, immediately behind the CORNEA. Hypopyon does not necessarily signify intraocular infection (ENDOPHTHALMITIS) but is often the result of sterile inflammation as in UVEITIS. The presence of pus in the anterior chamber of the eye associated with infectious diseases of the cornea (e.g. severe microbial keratitis, corneal ulcer), the iris or the ciliary body (e.g. severe anterior uveitis). The pus usually accumulates at the bottom of the chamber and may be seen through the cornea. See hypopyon keratitis; Behçet's syndrome. Slit lamp examination indicated cellular deposits on the corneal endothelium, hypopyon, fibrinous exudate. The anterior chamber was examined to exclude anterior chamber reaction with or without hypopyon. Abramson DH, Wachtel A, Watson CW, Jereb B, Wollner N: Leukemic hypopyon. Behcet disease was first described in 1937 by Turkish dermatologist HulusiBehcet as a triple-symptom disease characterized by recurrent oral and genital aphthosis and anterior uveitis with hypopyon. Non-specific features were conjunctival injection, corneal epithelial defect, suppuration, stromal infiltration, anterior chamber reaction and hypopyon. About 43% of the total study population presented with features of anterior uveitis which include fine fresh KPs on back of cornea, with posterior synechiae, festooned pupil and hypopyon. To our knowledge, the presentation of bladder carcinoma with unilateral anterior uveitis with hypopyon has not been reported to date. 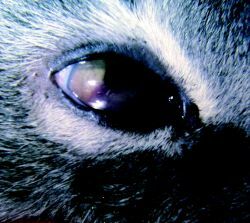 Anterior chamber of eye affections such as hyphema and hypopyon were recorded in 2 and 3 animals respectively. Endophthalmitis is frequently associated with photophobia, pain, loss of vision, and 'red eye,' while hypopyon may also be present. Hyphema and hypopyon are rare in primary glaucoma, but can appear in secondary glaucoma due to various diseases. Postprocedural signs and symptoms included pain, vision loss, retinal hemorrhage, hypopyon, and vitreous haze.